Download "DETECTING AND PREVENTING IP SPOOFED ATTACK BY HASHED ENCRYPTION"
5 networks and a signatures list of its neighbor routers. If a packet satisfies neither of the two conditions, it is looked as illegitimate and dropped. 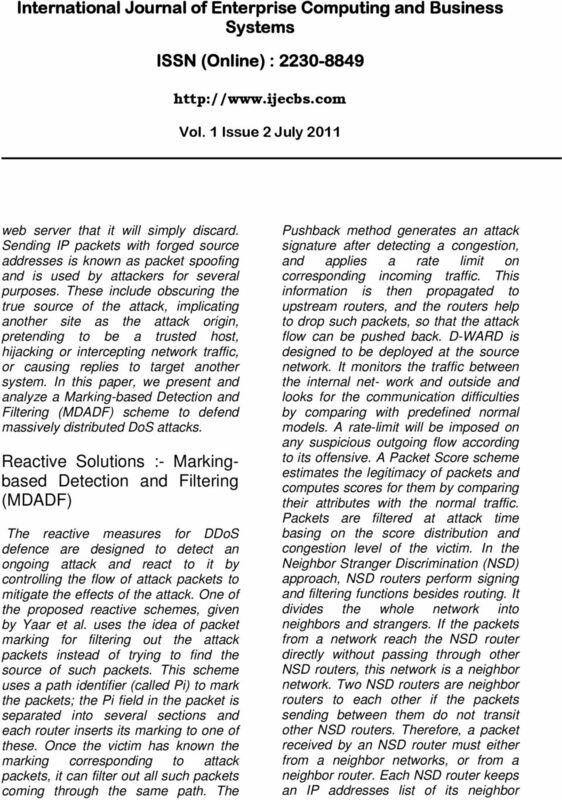 The success of the reactive schemes depends on a precise differentiation between good and attack packets. Designing an Effective Protection Scheme Generalizing from the various defense mechanisms, a good protection scheme against DDoS attacks should be based on continuous monitoring, precise detection and timely reaction to attacks. 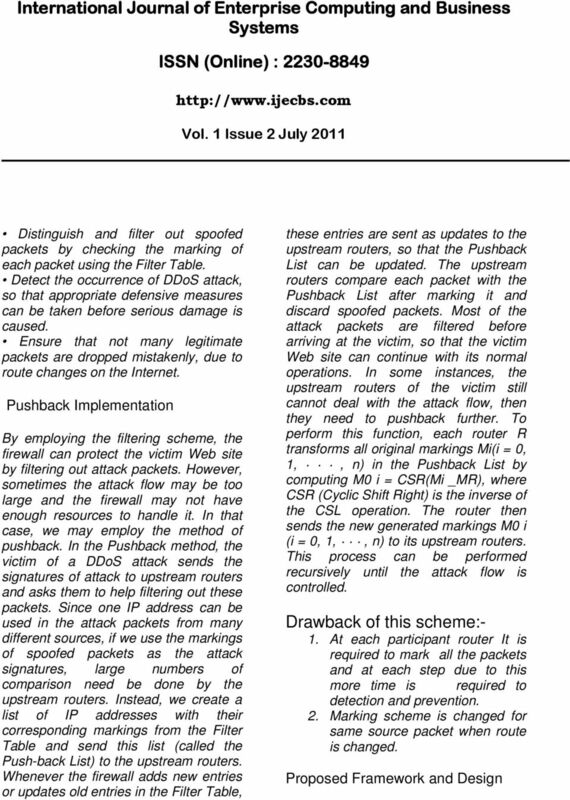 The following characteristics are desirable: The scheme should be able to control or stop the flow of attack packets before it can overwhelm the victim. The timely detection and immediate reaction to an attack is essential, to prevent the depletion of resources at the victim location. The suitable place to deploy defense scheme are the perimeter routers or the firewall of a network. In stopping the flow of attack packets to the victim, the scheme must ensure that packets from legitimate users are successfully received so that the service to the legitimate users is not denied or degraded. Any degradation in service would signify a partial success for the denial of service attack. The implementation cost should be low. Unless most internet users fully recognize the threats posed by DoS/DDoS attacks, it is difficult to get cooperation from them in defending such attacks, especially when the investment required is costly. Therefore, any viable DDoS defence scheme should require minimal participation of third party networks or intermediate routers on the internet. A good defence mechanism should be able to precisely distinguish the attack packets from the legitimate packets. What makes it difficult to control or stop the DDoS attacks is the use of spoofed IP address. 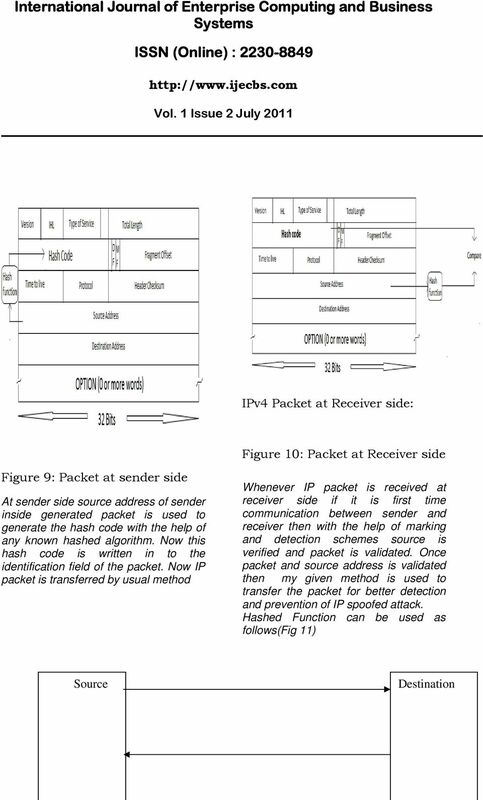 Spoofed packets are commonly used in DoS/DDoS attacks to hide the location of attackers and the compromised machines, so that the paths to them are concealed. Also, the success of the reflector attacks and many of the basic DoS attacks require the use of spoofed IP addresses in the attack packets. In the reflector attack, attackers flood the victim through some hosts called reflectors.they control the compromised hosts to send a large number of packets to many reflectors with spoofed source IP addresses of the victim. All the reflectors will send responds to the victim, so that the effect of the attack is amplified many times. Also, the attack path becomes unclear due to the participation of reflectors. Some of the DoS attacks, such as smurf, fraggle, land, and the flood attacks, need to spoof their packets, using the victim s or random IP address, to fulfill their attacks. If we can distinguish the packets which have spoofed IP addresses, then these packets can be selectively filtered out by a firewall to stop most attacks. 6 Detecting and Preventing IP-spoofed Distributed DoS Attacks Though source IP addresses can be spoofed by attackers, the paths packets take to the destination are totally decided by the network topology and routers in the Internet, which are not controllable by the attackers. Therefore, the path of a packet has taken can really show the source of it. By recording the path information, the packets from different sources can be precisely differentiated, no matter what the IP addresses appeared in the packets. 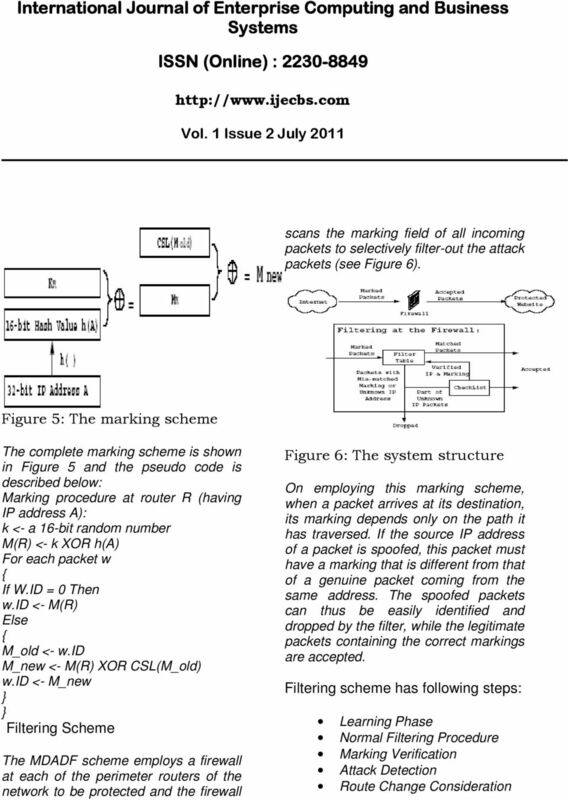 Packet marking, which is firstly proposed by Savage et all-in the PPM scheme, is a good method to record path information into packets. 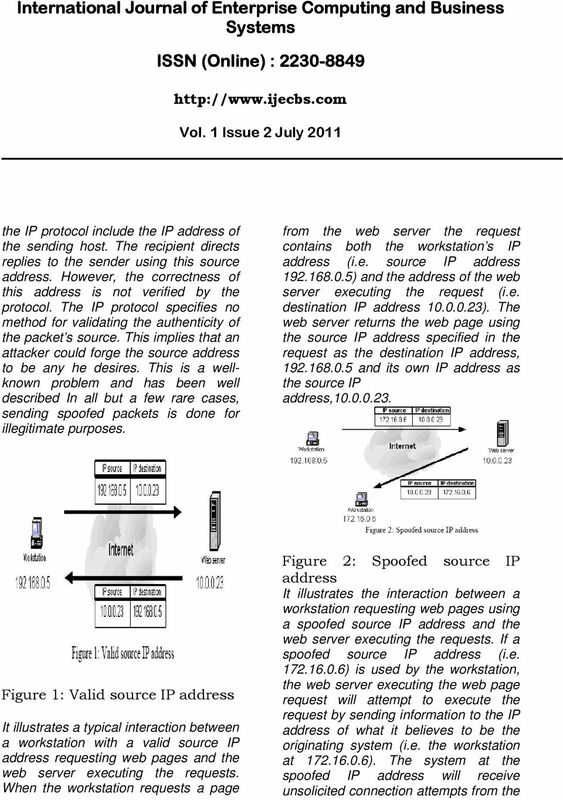 To indicate the path a packet traverses, the simplest way is to add all the routers IP addresses into the packet. The number of hops a packet passes through in the Internet is about 15 on average and mostly less than 31 Since the length of a path is uncertain, it is difficult to reserve enough space in the packet to put all the addresses, and the packet size increases as the length of the path increases. In order to avoid the increase in packet size, a possible method is to put all information into a fixed space. A router puts its IP address into the marking space of each packet it receives; if there is already a number in that space, it calculates the exclusive-or (XOR) of its address with the previous value in the marking space and puts the new value back. This method ensures that the marking does not change its length when a packet travels over the Internet, so the packet size remains constant. 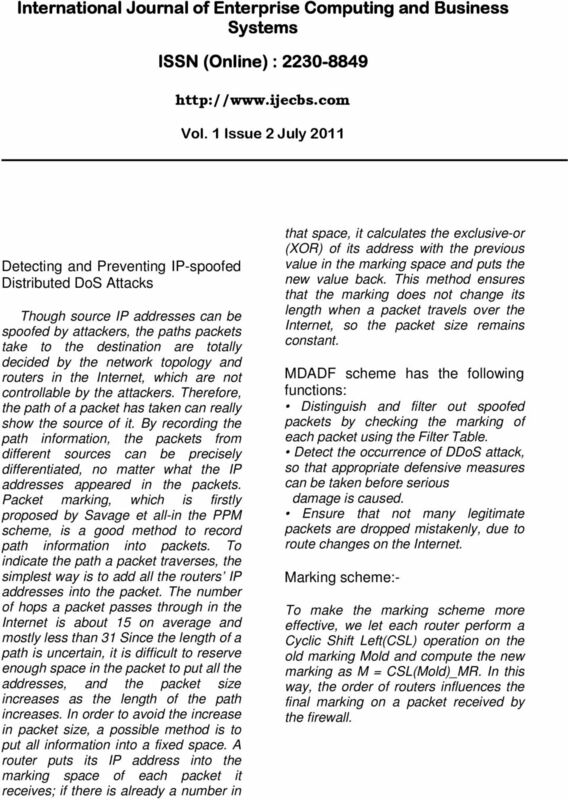 MDADF scheme has the following functions: Distinguish and filter out spoofed packets by checking the marking of each packet using the Filter Table. Detect the occurrence of DDoS attack, so that appropriate defensive measures can be taken before serious damage is caused. Ensure that not many legitimate packets are dropped mistakenly, due to route changes on the Internet. Marking scheme:- To make the marking scheme more effective, we let each router perform a Cyclic Shift Left(CSL) operation on the old marking Mold and compute the new marking as M = CSL(Mold)_MR. 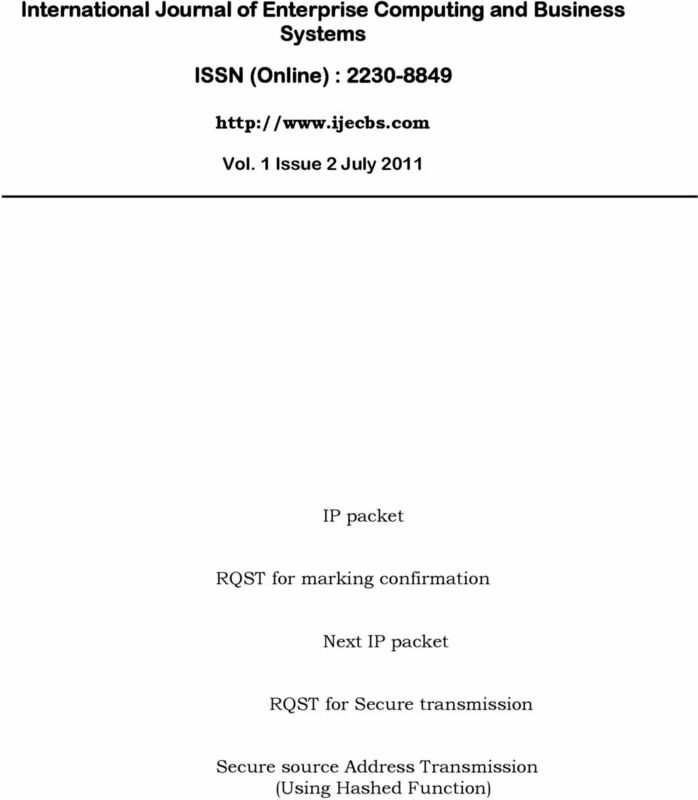 In this way, the order of routers influences the final marking on a packet received by the firewall. 8 Learning Phase To distinguish the spoofed packets, the firewall needs to keep a record of the genuine markings. During normal time that no attacks are happening, the firewall can learn about the correct markings for packets sent from specific IP addresses. 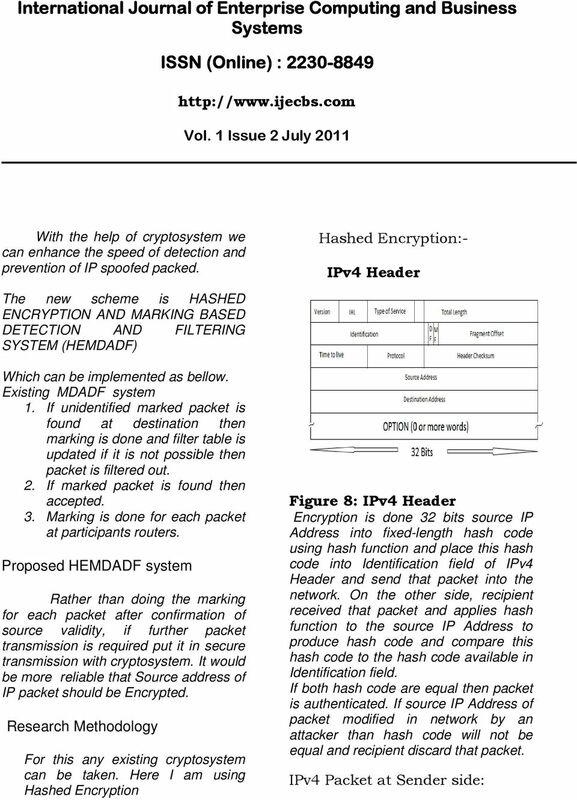 The (IP-address, Marking) pairs are stored in a Filter Table1, which are later used to verify each in coming packet and filter-out the spoofed ones. The learning phase continues for a sufficient time to allow most of the filter table to be filled up. If the Filter Table gets full, any new entry to be added replaces the oldest one. 1The filter table can be implemented as a content-addressable memory to speed up the filtering process. Normal Filtering Procedure After the learning phase, the firewall begins to perform its normal filtering operations. To the packet from an IP address recorded in the Filter Table, it is accepted if it has a consistent marking; otherwise, it is dropped. For the packet from a new IP address, we accept it with probability p and put the (IP-address, Marking) pair to a Check List, so that the marking can be verified. The value of p is set to high (close to 1) initially. When an attack is detected, the value of p is decreased according to the packet arrival rate and the victim s capability for handling the incoming traffic. Marking Verification To verify the markings in the Check-List, a random echo message is sent periodically to the source address for each (IP-address, Marking) pair in the Check-List, and a counter is used to record the number of echo messages have been sent for it. 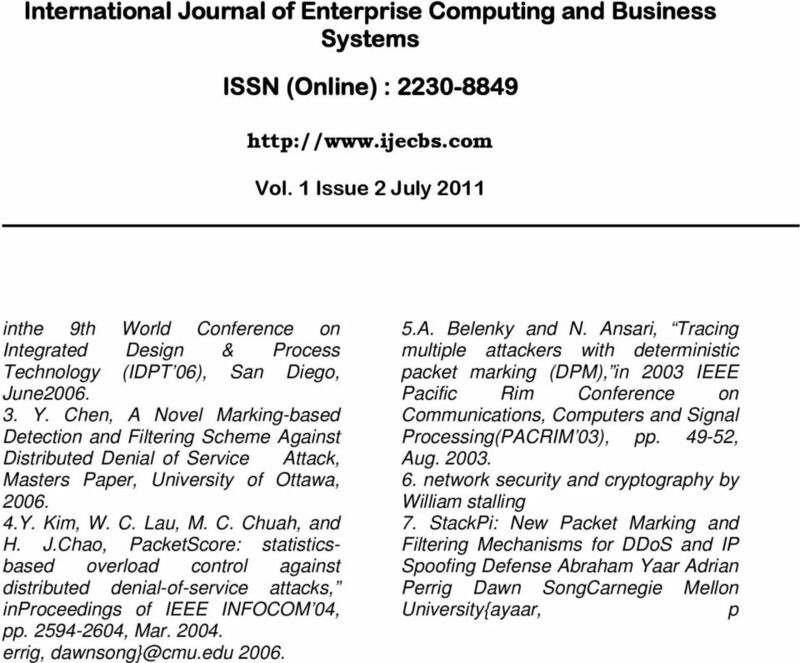 To avoid the reply being imitated by the attacker, the content of the echo message is recorded in the Check-List and compared with the content of reply received. 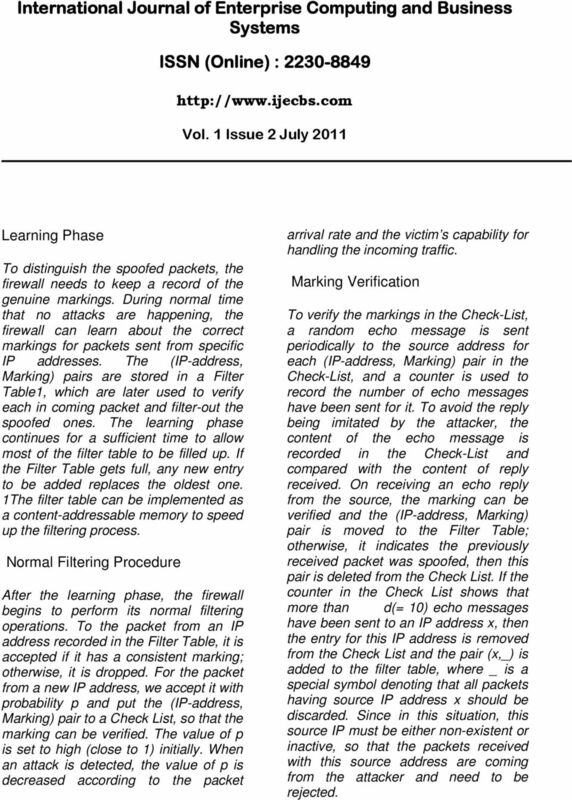 On receiving an echo reply from the source, the marking can be verified and the (IP-address, Marking) pair is moved to the Filter Table; otherwise, it indicates the previously received packet was spoofed, then this pair is deleted from the Check List. 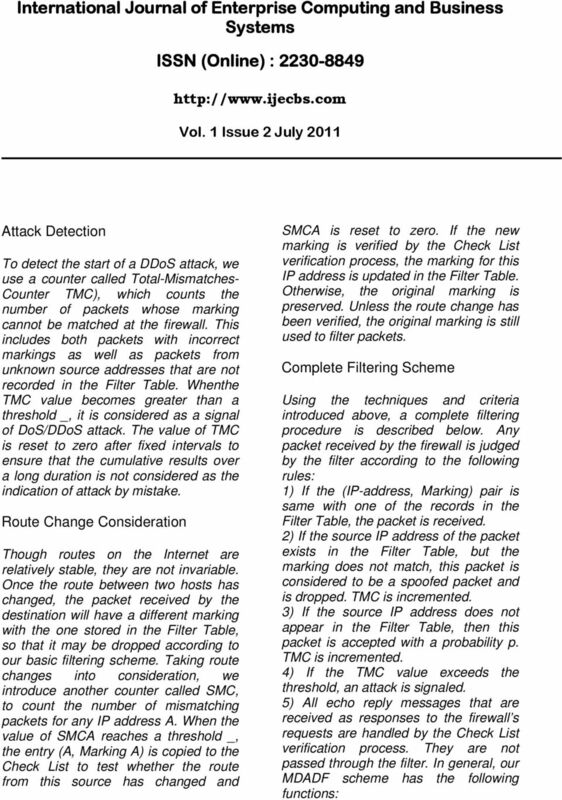 If the counter in the Check List shows that more than d(= 10) echo messages have been sent to an IP address x, then the entry for this IP address is removed from the Check List and the pair (x,_) is added to the filter table, where _ is a special symbol denoting that all packets having source IP address x should be discarded. Since in this situation, this source IP must be either non-existent or inactive, so that the packets received with this source address are coming from the attacker and need to be rejected.